I have been sworn by these tyres by many in my riding group. Comfy and smooth ride, with great efficiency. Only done a couple of rides but early days, they feel fast and light. No punctures, no slips on new rubber,they feel grippy but roll well. They fitted easily onto my dura ace c40 wheels and feel like quality rubber in your hand.I think these tyres are going to be around for a long time. Great looking tyres and I'm sure they'll ride fantastic as per usual from Conti GP. My 32s were awesome but I've switched them to my hybrid for some slight aero gains. The biggest problem I've got is trying to get them on my DT swiss rims. I had no issues with the 32s, but I've killed 3 inner tubes trying to get the 28s on, and I'm not a rank amateur at tyre changes. I have always loved Conti's GP4000's and have used them all year round for many years, so it was a no-brainer to try the GP5000 for my new race bike. Previously I have ridden tubular for racing but as I have a nice set of 50mm Campag deep section clincher rims I decided to fit these with a decent tyre for racing, went for the 25mm front and rear. They certainly feel good and I won my first 2 races using them though not all that can be put down to the tyre. Not cheap but if you want a fast high performance road bike tyre then I definitely recommend. Great tires. Even better than the GP 4000, plus they are truer to size so the 28s actually fit my frame. Great tires at a great price. These tires perform well in all conditions and are very puncture resistance. Best tires I have ever ridden on . Fantastic all round tyres. I got the 32s and the grip, comfort and stability is fantastic. I've decided to switch the 32s to my hybrid and go for 28s on my roadie to help get a few more kph if I can. Only done 150km so far, but they still look brand new and haven't had a single sketchy moment despite some horrific weather on my rides. Switched from gp4000 to these. They feel pretty similar so far, fast rolling, grippy in the wet and no punctures as yet. So far so good. Time will tell with durability. As always, good price from Merlin! Definite improvement in grip over the 4000. Great tyres. Light weight with low rollling resistance. 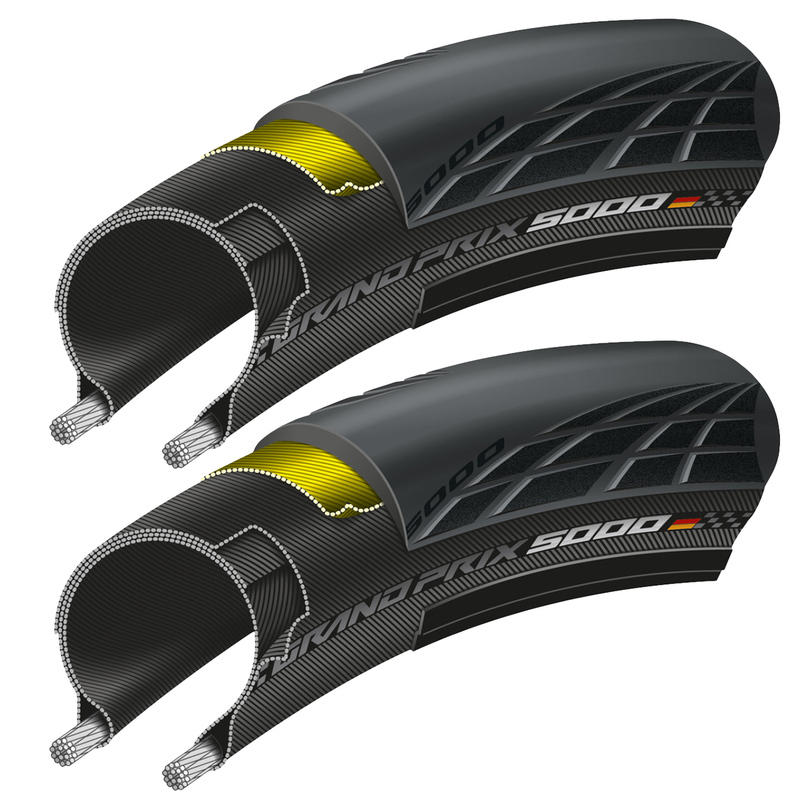 These are perfect for my new carbon rims. I just installed a 25mm GP5000 up front, replacing the Panaracer Race A Evo* I've been running for most of the winter. It felt a little faster right away, as was expected, based on lab testing and the fact that it was so supple right out of the box (compared to the 4000). Performance on the road was very good as well. Turn-in was smooth and predictable, and grip in turns was especially confidence-inspiring (and these days my confidence is not easily inspired). I did feel it was a bit vague and not optimally stable at higher speeds, but less so than the 4000 (which is why I stopped running that tire up front). Still, not as stable as the better tires in this regard, such as the Corsa G+, Race A, and Power Competition. Ride quality is noticeably improved as well, at least with small bumps and high frequency chatter. Whether that is a function of the new elastomer layer or the supple casing, it's a welcome improvement over the somewhat harsh-riding 4000. Also welcome, and not, is a meaningful reduction in size from the 4000. Great to have the 5000 run closer to it's stated size (and other tires), but good luck figuring out the optimum size for your bike now. As a reference, my 25mm 5000 measures just over 27mm on my 19mm internal rims (whereas the 4000 measured nearly 29). Unsurprisingly height (and volume) are reduced as well. Let's hope that puncture-resistance and lifespan are not, and remain as excellent at they are in the 4000. Regardless of that, these are clearly going to be the "race" tires to beat this year. *Great winter tire. Excellent ride quality and grip, reasonably fast, and very puncture-resistant (both tread and sidewalls). Cost peformance is one of the best and comparison with GP4000S II this tyre is more comfortable. Great looking, easy to put on (even with false finger nails) & fast to ride. Seemed to reduce road vibrations but that might just be because my last contis were nearly threadbare! Happy with product. A great improvement on an already brilliant tyre. Its not the fastest, lightest, grippiest or sturdiest, but it is the best all round tyre that does better than average in all categories. Absolutely worth the money. Have ridden for a few weeks and they are an excellent tyre.. Highly recommend it. So far, so good. Seem to be more robust than the 4000S. Amazing! When I read that it was going to be just like the 4000s ll's but lighter, faster, more puncture resistant and grippier, I didn't believe it. But now that I have ridden them, I can't help but accept that they are. From just using these tires, my average speed raises from 1-2 km/h! Taking on the local switch backs at top speed, I feel even more confident that I won't slide out and I beat my PR by 10 seconds after a light rain, then by 45 seconds on a dry day! Highly recommend, defiantly a good investment. I will be riding these for many years to come. Very impressed. Improved rolling resistance, lighter, still durable... these are the best all-round road tyres.